Cleo is having a terrible day. It’s raining outside, her best friend Nick is away, and her parents are busy. There’s nothing to do that doesn’t seem to land her in trouble. When she spies her reflection in one of the rainy day puddles, Cleo has an idea – and her day gets brighter. In a second story, Cleo desperately wants a pet. Her friend Nick has a new puppy and it seems like everybody in her class has a pet of some sort. Mum and Dad say a poet is a lot of work. But when Cleo sees Dad trying to get rid of the snails in the vegetable patch, she has an idea. 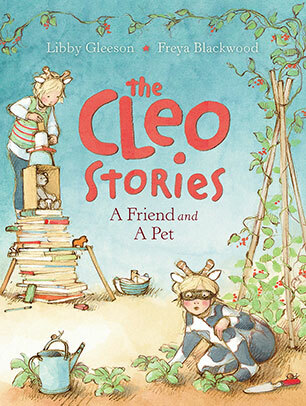 The Cleo Stories: A Friend and A Pet is the second book featuring the endearing Cleo and her family. The two stories in this new volume are just as wonderful as those in the first. Cleo is inventive and loveable, but she’s not perfect, making her someone young readers can relate to. The format of the books, in hardcover a little larger than a regular chapter book, and with sumptuous colour illustrations on every spread, is inviting, and makes them suitable for either independent reading or sharing with an adult. Both adult and child will fall in love with Cleo.